I'm writing this at 5:30am so pardon me if I'm brief and not too clever. Clever usually doesn't kick in until 5:45am… after my first coffee. The quote above doesn’t really have anything to do with this post. It’s just a substitute for me being clever. And it's wise. I couldn’t pass it up. I am finding there are drawbacks and benefits from working at home. A major drawback is that (in the country) it’s easy to get a bit “shack wacky.” The weather is still too bad to take extended walks with Henry so we stick to the same route every day. That will change whenever spring decides to arrive... So I’m pretty much stuck in these four walls. But there’s good things too. One is I’m not tempted to walk to the grocery store and drop $20+ every day. Another benefit is that you can walk from the office to kitchen within seconds for a quick healthy lunch or snack. That closeness also makes it very easy to both create on the computer (I’m a graphic designer) and create in the kitchen. One necessity – the well stocked pantry. 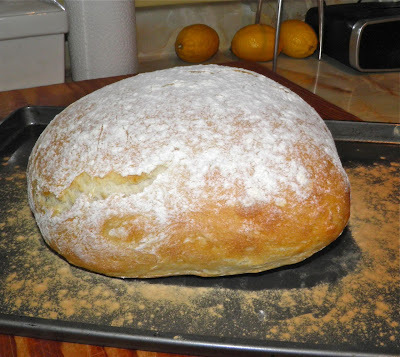 One of the easiest things to create in the room with the oven is bread. 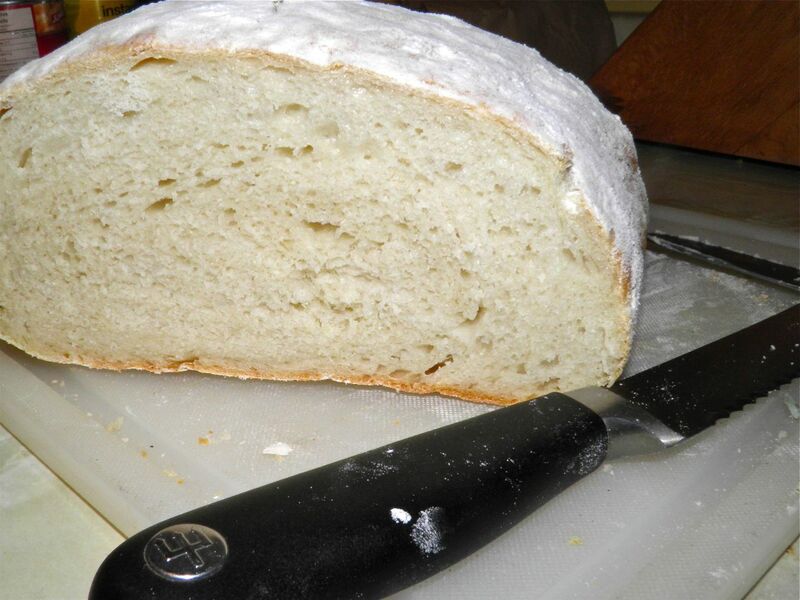 Bread is so very, very simple. 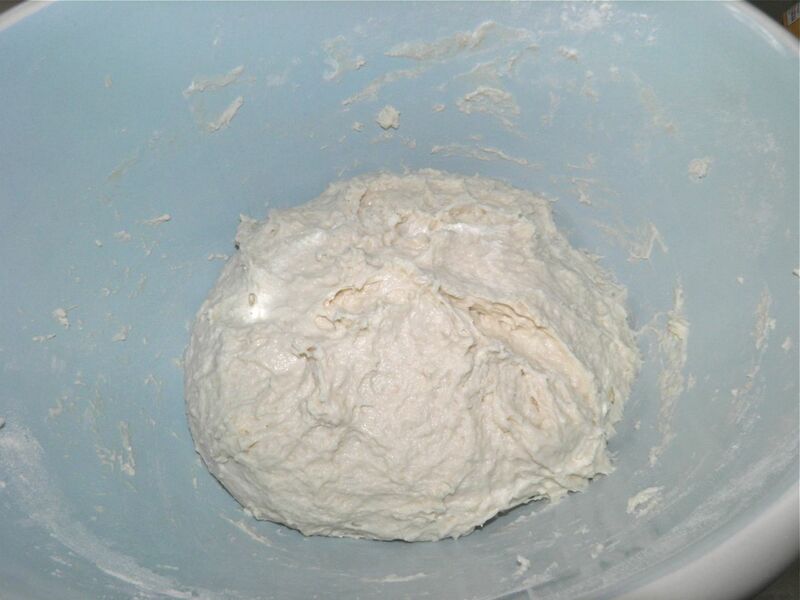 Water, yeast, salt and flour. All you need other than that is warmth – and time. I’ve got plenty of time, seeing that I’m only a few feet away all day. Many of my bread recipes have an 8-hour rise. That’s a work day. Mix in the morning (or night) and bake when you get home at the end of the day (or when you get up). Easy peasy. A long raise is a form of autolysis. That’s when the water in the flour realigns the gluten strands, making kneading either very short or completely unnecessary. This bread recipe could be done that way as well. But since I was home I opted for the 2-hour rise, and a bit of kneading. The result is a rich-tasting, sturdy loaf that is perfect for sandwiches or dipping into broth or gravy. I would imagine it would take to a French onion soup like a duck to water as well. Mix together the warm water, yeast and sugar in a large bowl. Let sit until the yeast has activated and is creamy. If it doesn't throw it out and start with new yeast. Add the oil and flour and mix together. The dough will be very wet and sticky. 2) Squeeze the dough with your hand (somewhat messy) for about 4-5 minutes. This activates the gluten less than the mixer, but I was too lazy to go get my KitchenAid… It currently lives in the basement. Cover the bowl with plastic wrap and a towel and let rest for 2 hours. By that time it will have doubled (at least). Preheat the oven to 400°F with a pan of water on the lowest rack. 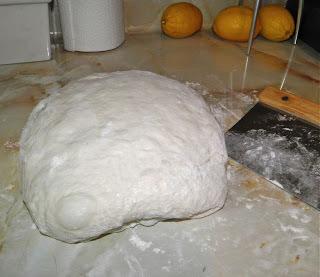 Scrape the dough out onto a floured surface, Do not punch it down. Shape by turning over onto itself (like folding a letter) with the aid of a dough scraper. Do this about 6-8 times. You will end up with a sort of rectangle. 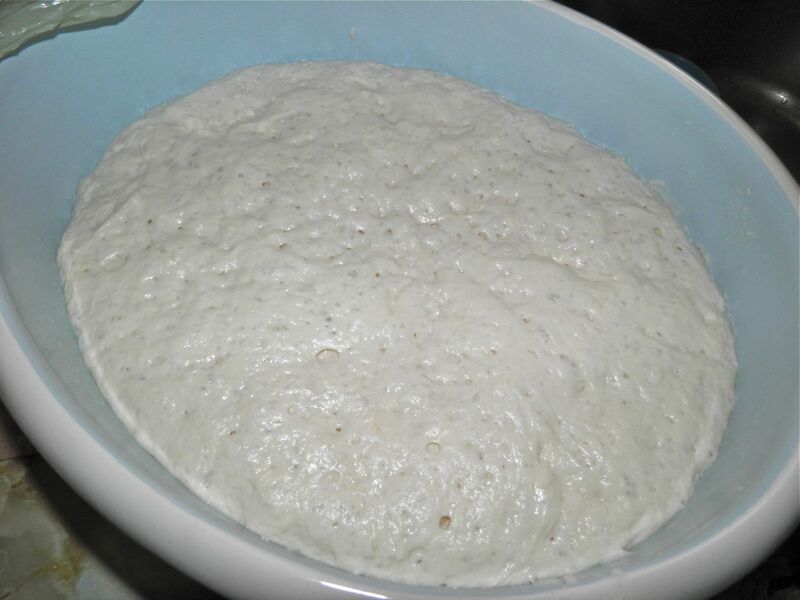 Place the dough on a well floured baking sheet. Shape into a rectangle about 12" x 6", of even thickness. Dust the top with flour. Let the dough rest for about 20 minutes. Bake for 10 minutes with the water tray in the oven. Then remove the tray and bake for a further 20-25 minutes, until browned on top and sounds hollow in the centre. Let cool slightly before cutting, if you can wait.